This BBC debate concerned the proposal to remove Aberdeen’s Union Terrace Gardens and replace them with something called the Granite Web. As the audience took their seats for the debate concerning the intended destruction of the city’s unique green basin a meeting of minds took place in the shadows of Queen’s Cross church hall between Aberdeen City Councillors, the advocates for the controversial development and BBC staff. Then it was time to begin. Brothers-in-arms Council Leader, who I had taken for a cub reporter, SNP Councillor Callum McCaig sat next to Ian Wood, the man who stepped in to stop the exciting Peacock development in Union Terrace Gardens with his own scheme and succeeded in changing minds among SNP Councillors and one time supporters of Peacock with his promise of £50million contribution towards his vision. Opposing them were Lewis Macdonald, Labour MSP and Mike Shepherd from Friends of Union Terrace Gardens. From the start it became clear that while the bulk of the audience was a mix of opinions a couple of rows at the back was packed with a phalanx of Wood cheerleaders. It must have been coincidence they were all together and intent on being the most vocal of elements in the hall. No sooner had proceeding got underway than the packed rows jelled into a veritable beast of astonishing intolerance towards opinions they didn’t share. The opening point raised from the audience was a silly notion which sprang from original literature on the scheme that the development would be the answer to ‘undesirable elements’ that populate the Gardens. It’s a no-brainer – it won’t. As was countered from the audience, any so-called undesirables will not disappear because Union Terrace Gardens don’t exist, they will be hanging about the Web (granite or more accurately concrete). There was a snort from the back of the room. McCaig was asked why he had once supported Peacock’s innovative development then switched support to Wood’s project. He did not answer this. But he underlined his support for the Aberdeen millionaire Wood in his ambition. From behind came a shake of a Rolex on a hirsute wrist and a black forked tongue dribbled long shards of stringy spit in ecstatic anticipation and released a roar of approval. Someone asked about the glaring absence of democracy surrounding the project. The beast heaved with indignation and emitted a belch of sulphur. Wood ducked the question and mumbled something about preserving heritage: balustrades, statues, Kelly cats, arches but altogether managed to miss the point entirely that the sunken Gardens is the main heritage feature, practically the sole remnant of the medieval town. The beast shifted: tiny red-infused eyes shiftily sweeping the ranks of dissenting voices from the audience. Its man had spoken. Wood and his family made its fortune from working out of Aberdeen, in fishing and later in offshore energies. They are not alone. There are many millionaires in Aberdeen. You wouldn’t know it. The money is private money. There is nothing to show in the city for the wealth it helped create for these millionaires. This has been a complaint from the city’s people for decades. Now money is on offer. With strings attached. No such thing as a free lunch. Not for ordinary citizens of Aberdeen. I’m sure there is for some. Mike Shepherd talked up the park. He was fed up hearing this unique green basin being denigrated by those determined to get their way to pour in concrete by the hundreds of tons to create shabby walkways above street level. A glint of Rolex and a shudder of mohair. Someone in the audience mocked the Gardens. He clearly wasn’t from Aberdeen. He had taken a photograph, he said, so he knew what they looked like. They looked frightful. He gave no sense of realising their significance. Lewis Macdonald disagreed, saying that this green heart of Aberdeen will be replaced by concrete walkways and that the consultation on the 6 shortlisted designs had not come down in favour of this Web. A long impatient tail beat out a disturbing rhythm and the head turned on the thick neck sighting someone with the audacity to mention that recent architecture forced on the city had been of poor quality – his inference being this scheme was no different. It listened as its collaborator McCaig talked up PricewaterhouseCoopers promise of 6500 jobs. He referred Charles Landry who had worked in Bilbao and considered this the best transformation project he’d seen in 20yrs. And still no word of democracy. Andwhat are the views of anyone in Aberdeen compared to those of a man who once worked in Bilbao? Macdonald countered the jobs claim by revealing that PwC job figures were based on its collective experience and not through looking at Aberdeen as a discrete scheme. The beast drew back its lips and snarled. The beast snarled. The tail beat the floor. Again and again. The head pulled back and a cold reptilian stare settled on the little people who dared question the great man and his backers. This Council is closing schools and cutting services to the disabled and yet there is commitment to spend millions of public money voiced an audience member. The council leader had nothing to say. A Prada stiletto scourged deep into the grain on the church hall floor and the beast opened its jaws releasing its sulphurous stench. McCaig was asked to sell TIF to the audience. TIF is the controversial scheme the council hope will eventually pay back the huge sum of money it will have to borrow to finance Wood’s idea. It will be based on two areas of the city being designated as special areas. Whenever a business sets up it will contribute towards TIF and this money will be ring-fenced to pay back the loans. Of course it is pure speculation that enough money will be raised by TIF. It is a new system of raising funds in Scotland. In fact Aberdeen City Council is not even sure it will get government permission to establish TIF sites. There are many unknowns regarding TIF including a description of it from McCaig. The above is my explanation. It might not be up to much but it was more than we got from McCaig who appeared surprised to be asked to sell this scheme to the people of Aberdeen. Sell it? He couldn’t even describe it. Immediately he jumped to the Ravenscraig example, one of only 2 approved in Scotland. Brownfield site developments which as MacDonald pointed out can only add money, unlike this one being proposed for Aberdeen. A clearly unsettled McCaig was put out of his misery by the chairman who defined it for him. It’s good to know that Council representatives and the Council leader is so well versed in the detail of the scheme he is happy to put his name to. The beast shifted uncomfortably on legs of iron and feet of clay. McCaig did confirm the raising of the funding through TIF would be underwritten by the Council. Mike Shepherd referred to problems with TIF funding as an untried means of guaranteeing cash. Well so much depends on incoming business that no figure can be guaranteed. Fall back on council funding. Council’s borrowing while in debt and the risks to services if that happened. Possibly the most stupid question of the evening came from the vicinity of the beast. More a statement than a question that young people wouldn’t come to the city unless there was development in the city. This development. The Beast roared its approval. Wood spoke of the need for connections: road and air connections. But it’s bus connections Aberdeen City Council is talking about with this proposal. Connections to the bus station. The bus station so recently erected and so badly designed that there is no room for passengers and no seats provided for them, no dropping off and picking up places for vehicles to drive in, forcing passengers with luggage to walk from several streets away. This bus station where buses have to reverse into the station traffic each time they begin a journey. Would you trust the Council to do any better with such a radical scheme for Union Terrace? The same council which has continued to build shopping malls while Union Street empties. It is empty because of shopping malls. It is empty because the council refuses to reduce rates to keep businesses operating. The council has taken an impressive mile of granite architecture and created a desert. Mike Shepherd reminded Wood that his company, and every company, would not hesitate to set up anywhere, irrespective of what it looked like if there were profits to be had. He cited Wood’s company in Caracas and Lagos and that he doubted they went there because of how they looked. Don’t know about them but Wood looked confused. There was a grunt from the beast, a slash of something golden and an angry sweep of the tail. McCaig had nothing to say. Businessman Tom Smith, Chair of ACSEF the anti-democratic body given all the cards in this scheme railed at Macdonald for rejecting this multi-million pound ‘investment’ and yelled at Mike Shepherd to be quiet. He accused Macdonald of trying to stop any development from happening. The beast peeled back it thick lips and yelped frantically. Mac Donald insisted the divisions which had emerged over this proposal were because there was only one project, only one ambition and shared arrogance of the people behind this scheme. The audience breathed in the stench of cashmere soaked in sweat. The panel was not invited to address where anonymous literature landing through peoples’ letterboxes sprang from. The inference was that city businessmen were behind it. Well only businessmen could afford to do this surely. But why not reveal who you are? Councillor Kate Dean said Aberdeen was anti development and against attracting young people to come and stay in the city. Well it’s a point of view, fair enough but then she had to spoil it by saying how the city has done very well in the past in attracting people in. Really?? Without a totally transformed city centre? Not following that logic. When he was asked if Aberdeen City Council would spend any money on improvements to the city centre if this scheme was rejected by the people, McCaig initially said no then suggested there might be something. Then he went back to TIF repeating it was designed to pay for itself. That certainly is the plan Mr McCaig. And the point you are making is? Oh and that ACC is not in a position to splash out. Not a great deal of clarity here. He was asked about the arrangements for the referendum. What would be the winning line? What had been decided between ACC and the government? A harassed looking McCaig said nothing had been worked out. Hello? Nothing? The papers have gone out. Do you have faith in these people to act in your best interests? Macdonald interjected with the observation which most of Aberdeen have already made that a major reason for the lack of visits to the Gardens was because the Council had not spent anything on them over the years. Have you seen how the beautiful granite has been allowed to go green for lack of a bit of housekeeping? Why has the Council never even put in a set of swings or a climbing frame to attract children and families into the park? This would cost practically nothing. But they’re not interested. Mike Shepherd reminded the audience that another city businessman was willing to put money up front to make improvements to the existing Gardens, including better access and a park-keeper but James Milne has not received anything like the same attention in the local media that Wood has enjoyed. Wood said he regretted the divisions his scheme had created in Aberdeen to which Macdonald replied that it was because people cared so passionately and Wood’s undemocratic way of handling his proposal had resulted in such ill-feeling. I guess you don’t become rich by consulting with people. Well, maybe that’s not true as some well-known examples from the US suggest. It is clear this is not the Wood nor ACSEF way. The prospect of Aberdeen borrowing £92 million might be a risk too far for the more prudent Aberdonians but McCaig would have none of it – risk? What risk? He compared it to a household mortgage. Yes, and we’re seeing what’s happening to many of them at the present time. His parting shot was that people should see Aberdeen as others see it. So much for representing the people who vote for you Mr McCaig. Mike Shepherd urged people to vote against Wood’s backward-looking 1960s style concrete monstrosity in what is the city’s leafy green heart with its 200yr old elms. The iron legs strained, the stiletto scraped, the nostrils steamed, the beast screeched and cracked its cleft tail. Wood was given the final word. He emphasised the huge amount of work which had gone into working out the finances of the scheme and that the comments on TIF were ridiculous. Certainly were Mr Wood. He railed at his opponents for what he described as negativism but which they will say is approbation for the most positive development for Aberdeen that which involves retaining the magnificent Union Terrace Gardens. The beast is a simple animal. It is excited only by profit yields, retail opportunities and exclusive cabals in its determined drive to take the city forward into the past. It roared its approval. It roared and snarled and beat its swarthy chest and licked the fleshy lips in euphoric rapture. The referendum result will be known on Fri 2nd March if the Council works out how to read the results by then. Wonder why Ian Wood has SO much money? So Aberdeen City Councillors at a special meeting of the full council voted to place politics before commonsense over the proposed obliteration of Union Terrace Gardens. This nightmare of a design could only have been chosen by people of very poor taste. If there was any design more likely to stick out like a sore thumb which will turn the city centre into a depressing series of concrete walkways – this is it. The press release from ACC says the Web will ‘transform the Victorian Gardens’ but it will not transform them it will eradicate them. Shame someone entrusted to communicate with the public is so casual with words. Most councillors have been easily swayed by powerful influences (excluding Aberdeen voters) and the vote today confirms its determination to push ahead unless the public referendum returns a ‘no’ vote. The statement says how there will be ‘no need for direct revenue support from the City Council.’ So if something goes wrong and the anticipated cash through TIF fails to materialise then the council will do what exactly? Nothing? I suppose – the council has done just that for decades in Union Terrace Gardens. The reliance on the untested TIF scheme makes the funding of this scheme more IF than TIF. They say ‘the minimum space possible is used for commercial or semi-commercial purposes.’ This is meaningless so couched is it in qualification. This council has little interest in being careful with public funds. It will carry on spending in the hope of public agreement – £300,000 of public money. What’s that for a maybe cause? Easy come, easy go to the council. I did notice a reference to ‘provide no direct funding towards design, planning or construction costs for the CGP, other than that generated through TIF, already committed to the referendum, and to cover external fees.’ That phrase, ‘no direct funding’ is a little loose, isn’t it? There will be the safety net of ACC officers overseeing all these arrangements. Do you have faith in them given how the city has been run over the years? And this is the council which complains about how run down Aberdeen is – what have successive councils and permanent council officers been doing to earn their crusts while this decline has been happening? If they are not responsible for the decline then who is? And do you think they know what they are doing now? I note there still hasn’t been confirmation of the promised £70 million. Assume it’s still there in the post office but let’s face it, £70 million is only the start. The price is going to go up and up. Along with the headline figure of 6,500 jobs – couched in ‘up to’ or ‘as many as’ so a few dozen then – that won’t hit the headlines. Who have you heard challenging these ridiculous figures? Press? Councillors? Council officers? Do you get the impression this is what some of them want to hear? Such a parcel of rogues in a nation! Another kick in the teeth to the people of Aberdeen by the totally undemocratic clique empowered to decide on the preferred option for the development of Union Terrace Gardens. This clique, presumably selected by ACSEF ( a PPP and undemocratically elected body which is key to current and future developments in Aberdeen and Aberdeenshire) is made up of various people who have no obvious talents to be judge and jury over such significant changes to the city’s architecture and changes which will utterly destroy an important and treasured aspect of its heritage (excluding the council and ACSEF from that subjective comment). Heritage is a moveable feast. Mostly moveable in the case of Aberdeen which has no noble history in recognising what is worthy of preserving and what is not. Very little of Aberdeen’s once distinguished old city is extant. Those public figures who have been instrumental in the eradication of the old and distinctive areas and buildings in the city have created a homogenised urban landscape which leaves no lasting impression on the imagination. It is not stimulating place to be in. It is not a relaxing place to be in. It is the same as so many places up and down the country. No doubt something along these lines brought Ian Wood, a local multi-millionaire businessman, to conclude that economic expansion would only come (back) to Aberdeen if the city had a square at its heart. I would not disagree had he chosen the area in front of Marischal College. He didn’t. Aberdeen did have a park in its centre. It does have a park; Victorian gardens. And it is reasonable to see why someone with disposable income measured in millions might want to influence improvements to the centre of his home town (although that in itself calls into question the morality of influencing policy just because you have more money than most) but the motives behind the proposal have shifted since it was first envisaged. I have written about this before and am not going over old ground. Suffice to say that by creating a piazza ( and that was the term in use at the beginning of this whole UTG episode) the city would attract business is specious. I don’t for a moment imagine that Mr Wood ever moved his business into anywhere because of the look of the place, whether or not it had a piazza, but because of the economic returns his company hoped to bank. 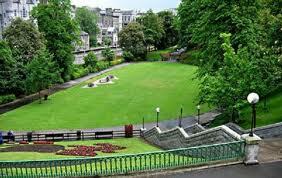 People in and around Aberdeen have long recognised Union Terrace Gardens needed revitalising. The fact that the once popular park has been left to degenerate to the extent it has is down to a dereliction of duty by Aberdeen City Council. The touches which could bring this wee gem of an oasis back into popular use are clear and would work out far, far cheaper than the extortionate scheme in hand. It looks like what swung the council in favour of this latest wheeze to bulldoze a unique city landscape is flattery. People (some people) are flattered by men with money. The undemocratic body knew the public’s favourite. One which preserved aspects of the old gardens and extended them. 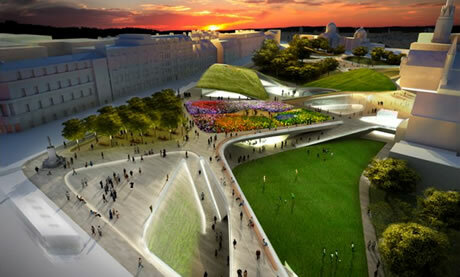 The undemocratic body did not select the public favourite but went for a radical design instead. And who makes up this appointed clique which represents the people of Aberdeen? Of the competition winner, this is what I said in an earlier blog on the subject. This is incredible. It’s like someone’s idea of a joke. For starters we have raised walkways, streamlined with figures wandering around. Now call me picky but can you see health and safety allowing people to walk at these heights without tall fences along the walkways? And quite right too, I could take a dizzy and topple onto the folk eating below, or if I was less polite I might… well. Cutting through the turgid descriptions of nature and culture fused into a ‘vital network’ – what ? – ‘an elastic web’ – ‘stretching across the historic river site – ’ which river would that be then? No rivers there. The Denburn. Far fetched calling that a river, ‘multi-tiered archaeology’ has anyone checked what this guy’s been drinking? 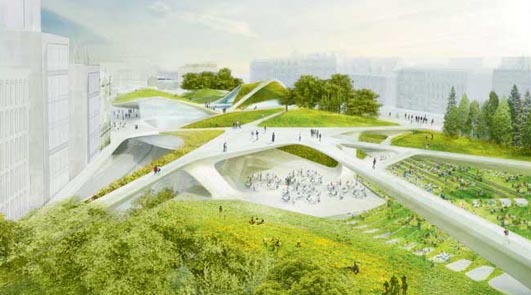 ‘quiet hang outs to meadows’, ‘the city’s emergent future’. Cutting though the crap. This design is a mess, misleading in its visualisation and frankly, an eyesore in the making. And it seems I’m not alone. The Los Angeles Times had a piece on 15th September 2011 about the winning company, Diller, Scofidio and Renfro entitled Culture Monster. ‘The real question is whether this project will prove to be the one where DS+R shows a clear ability to turn smart conceptual ideas into really affecting built space. Too many of its projects — the Institute of Contemporary Art in Boston and Brown University’s Granoff Center are two examples — have lost something crucial in moving from schematic to completed form; they are often thick with ideas but rather thin emotionally. Well the jury of architects may well be still out. Unfortunately the screw has been turned on the removal of Aberdeen’s city centre gardens for this vulgar acreage of concrete, Astroturf and a few potted plants. People of Aberdeen it is up to you. Are you prepared to let a group of the great unelected stick two fingers up to you – just because they can?